It can’t be easy having an identical twin- from the first moment you meet someone, you are considered part of a duo, rather than an individual being. Even if you have completely different interests, you are lumped in the same category as your twin, because for some people logic dictates that if you look alike, you must be exactly alike in every other way. While for some twins this may be a part of everyday life, the continuous grouping together is bound to get a little stressful for the less lenient. 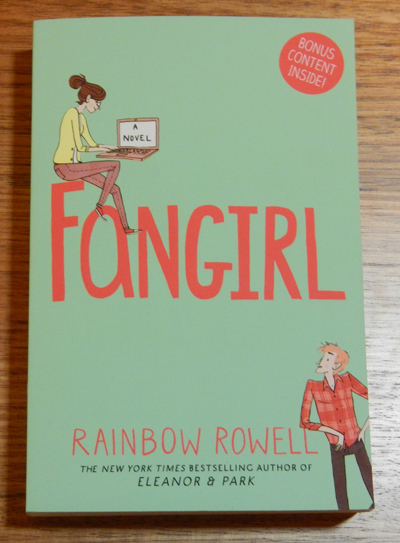 As is the case with Cath and Wren in Rainbow Rowell’s popular new teen book Fangirl. Until recently, the sisters did almost everything together- they shared mutual friends, they enjoyed the same things, and they both adored the Simon Snow books and films. In their shared love for the boy wizard character (who admittedly has many similarities to the Harry Potter franchise), the girls penned the fast-growing online fanfiction Carry On, Simon, giving the central characters an entirely new life within the world that the original author created. The co-writing of this fanfiction helped them get through some of their toughest times, including when their mother left them. But when the girls finish school, Wren decides that she wants to start a new life- a solo life. She wants to go to university, meet new people, and party. Cath is a little more hesitant about the plans her sister has created- she begrudgingly moves into student housing and meets her surly, mature new roommate Reagan (and Reagan's boyfriend Levi, who always seems to be around), and enrols in a creative writing course. But Cath, as insecure as ever, can only really relax and be herself when she’s writing her Simon Snow fanfiction. With thousands of followers online, waiting to read the latest scenes she has to offer, Cath is able to forget the now unstable world she is living in and emerge herself entirely in the steamy gay romance she has created for her central characters Simon and Baz. She has grand aspirations to complete her saga before the final novel in the series is released, and begins to neglect everything else in her life to reach her goal. This novel really illustrates just how difficult it can be to step outside your comfort zone. Cath’s entire life is thrown upside down when Wren decides she wants to fly solo, and it takes a long time for her to adjust to this new life as a solo person, rather than part of a duo. But with supportive new friends, and a little bit of nerd power, Cath is able to find her own way in life. Rainbow Rowell has really captured the heart of fanfiction and young love in this charming novel- Fangirl is sure to become a firm favourite for teenage girls everywhere. I have been eyeing this one off in the shops. It's interesting to hear what you thought of it.